EagleSpeak: On Midrats 5 Oct 14 - Episode 248: "Anti-Access Area-Denial (A2AD) with Sam Tangredi"
On Midrats 5 Oct 14 - Episode 248: "Anti-Access Area-Denial (A2AD) with Sam Tangredi"
Power projection, sea control, access, denial, and the ability to impose your will on the enemy from the sea - or depending on your perspective - prevent them. If the comparative advantage of American military power includes the use of the world's oceans as a basing area from projecting power and national will, how can other nations design systems and tactics to trump that advantage? What are in place now, and what can we expect to see in the near future? 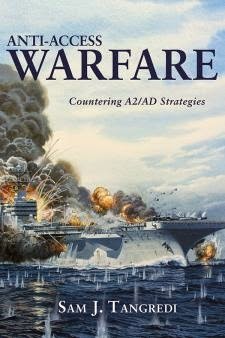 Our guest for the full hour will be Sam J. Tangredi, a defense strategist whose studies of future warfare prompted Defense Department officials to label him “the Navy’s futurist.” His thirty-year naval career included command at sea, service in key strategic planning positions in the Pentagon and overseas, earning a PhD in international relations, and research fellowships at two think tanks. His over one hundred publications—which include four books--have won awards, including the U.S. Naval Institute’s Arleigh Burke Prize and the U.S. Navy League’s Alfred Thayer Mahan Award. He is currently the director of San Diego operations for the planning/consulting firm Strategic Insight.